Whether you’re having a meeting with 10 people, a reception for 500, or a banquet for 200, we offer a premier community center space in Hamlet, NC. 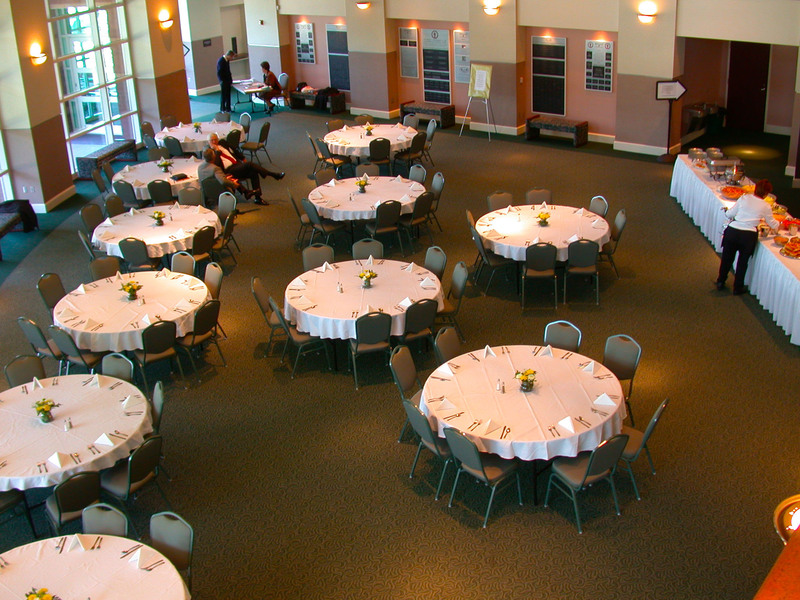 The entire facility at the Cole Auditorium is available for rent for both public and private events and is the largest banquet facility in the area, housing the auditorium, three banquet rooms and a lobby. As you can see on our Twitter feed where we post out events daily, the Cole stays busy with all kinds of events. An initial survery of available dates for your event can be made on our online calendar which is frequently updated. Depending on the events specifics, they may be space available for your event even is there is already an event listed on the date you prefer. A date with no events listed, however, doesn't guarantee that the date is available. Follow the steps below to confirm that the date is available. Contact the Cole Auditorium about availability by calling (910) 410-1691 or by emailing us. Because the nature of the events we host vary greatly, we encourage you to include as much information as possible when you call or e-mail. After more details are received about the event you are planning, you can request an information packet in which you will receive estimated cost information and facility information. For priority service, schedule an appointment to tour the facility and discuss your event and the required fees. Request to put a hold (free of charge) on the date which you have picked for you event. Sign the rental contract and put down a 25% deposit once the event is confirmed. Confirm insurance and catering service used. Make final payment and confirm table/chair setup no less than 14 days prior to the event. 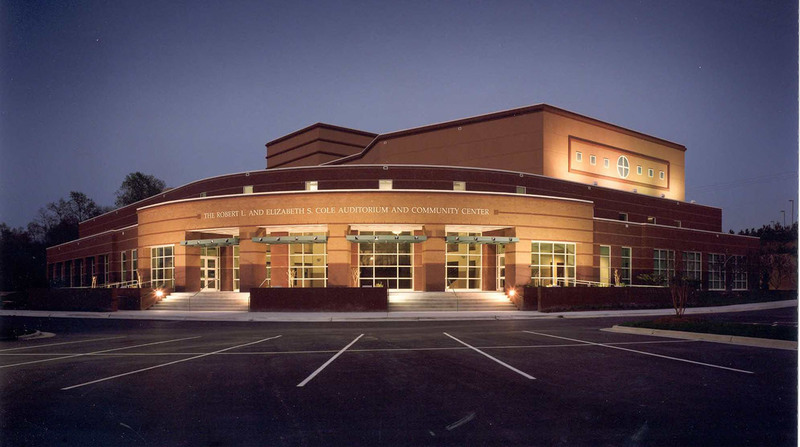 The Robert L. & Elizabeth S. Cole Auditorium and Community Center features three main areas: the auditorium, the banquet rooms, and the lobby. Visit the online photo gallery for photos from previous events. 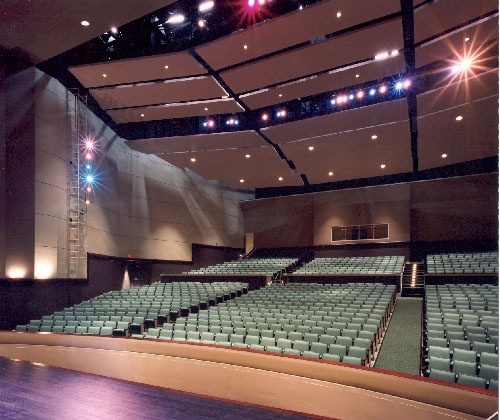 The Auditorium features state-of-the art lights and sound equipment and is a prefect space for concerts, speaker series events, church events, as well as many other types of events. We are able to provide trained, knowledgeable technical crew to set up and execute all aspects of Auditorium events that are familiar with all types of events. The Auditorium will seat 968 people (608 in the orchestra, 360 in the mezzanine. There are ten (10) additional seating spaces in the orchestra for those who are physically challenged.) Click here for a detailed seating chart. The stage 53 ft. deep at its deepest point (with 40ft being behind the proscenium wall) and 60 ft. wide. The proscenium opening is 24ft. high by 40ft wide. Click here to download a complete technical rider, including additional facility specs and complete details on the technical capabilities of the auditorium. Our banquet room space is one room that can be divided into three smaller, equally-sized rooms. Individually, the three banquet rooms are referred to as, The Burlington, The Hamlet, and The Rockingham. Each room measures 30 ft. by 42 ft. and will seat up to 75 for a banquet, depending on the type of set up utilized. When used as one large room, the banquet room measures 90 ft. by 42 ft. and will seat up to 275 for a banquet or will accommodate up to 500 for a reception (no seating), depending on the type of set up utilized. Each event that is hosted in the banquet rooms is unique and our staff will work with renters, vendors, and visitors to ensure the space meets expectations. There are three typical types of setup that are employed in the Banquet Rooms for events. The space is ideal for meetings, expos, conference workshops, banquets, class reunions, and wedding receptions. The Lobby, named for Mrs. Sally Cole, is a beautiful setting for smaller receptions, wedding ceremonies, and banquets. The Lobby will accommodate approximately 125 people for a banquet and 300 for a reception, depending on event specifics and the setup utilized. For wedding ceremonies or other events that utilize a theatre-style setup, the space and accomodate around 200 people. 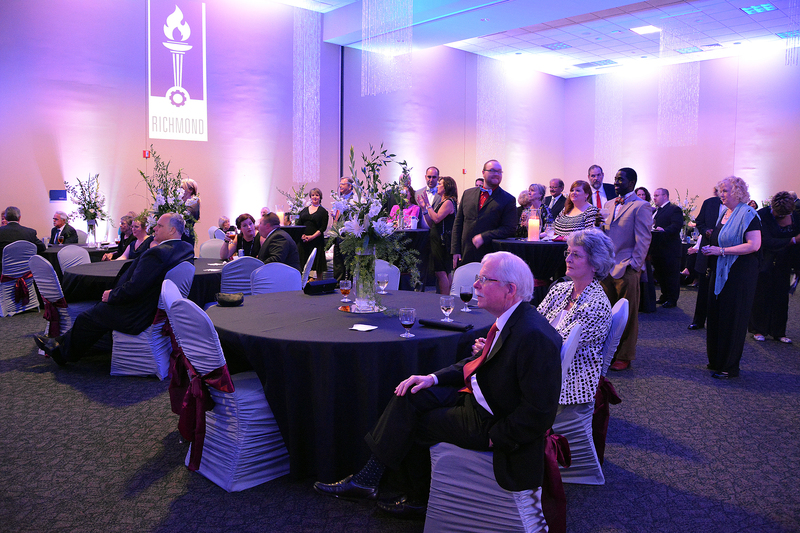 The Lobby can be used alone or in conjunction with events held in the Banquet Rooms.